The Offices of Marketing and Communications publish Tusculum, The Magazine of Tusculum University twice yearly. 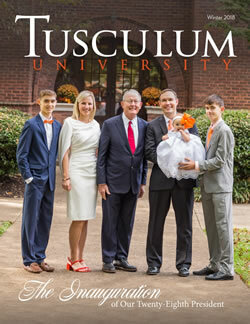 The official magazine of Tusculum University is published twice yearly. The Offices of Marketing and Communications are also committed to publicizing the activities and successes of Tusculum University students, faculty, staff and alumni and friends. Links to the current and previous issues of the magazine are provided below. As well, links to interactive versions of the magazines are also provided below in HTML5/Adobe Flash.